Steven (Chicagoland, United States) on 13 December 2013 in Landscape & Rural and Portfolio. A Key West sunset captured on Mark's cell phone camera while we were on a glass bottom boat sunset cruise in Key West, Florida. Photo captured September 25, 2013. My laptop has crashed (won't boot up, has gray screen). Not certain on my return. My apologies in advance for not visiting your blog. Marvellous composition - dynamic image as well with the speeding boat. Very pretty shot, our phone cameras are getting an awful lot better these days! A fantastic composition with beautiful colours and light and the speeding boat ads so much to the image. 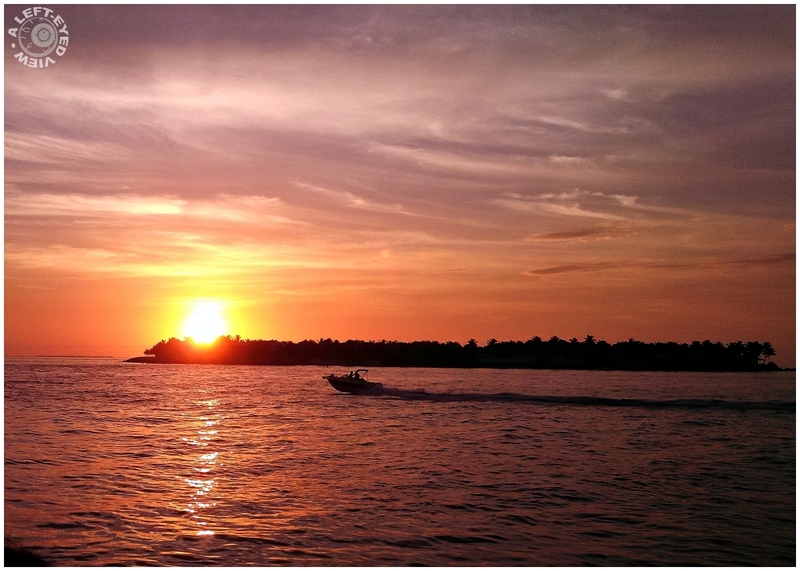 Taken with a Motorola just shows one do not need expensive equipment to capture beautiful images . Well done. Beautiful shot and vivid red colors! Well done. Key West has such a special place in my heart, I learned to SCUBA dive there some 20 odd years ago, I have sense become a dive master. Beautiful photo of this beautiful place. A wonderful sunset scene superbly captured ... the colors and shine are spectacular !!! Beautiful capture of this tropical sunset. I feel bad for all the people that are unable to experience this beauty in person. so beautiful composition, tones, lights & reflections! A wonderful sunset. The warm colors silhouette an excellent composition. Wonderful color and terrific capture from the phone. I'll ditto Ferret's comment re: how sad for those who never experience this beauty! Flamboyant sky. Great shot Steven. The only light and colors are beautiful. Excellent composition. Wow! Gorgeous color! Instead of riding off into the sunset, it is boating off into the sunset! That must have been a wonderful vacation! I have always wanted to spend some time there. You would never know it was a cell phone! Beautiful sunset, the boat add the movement to this scene made it more interesting, Love it. It is like they are chasing the light - brilliant presentation. Magnifique contre-jour ! De très belles couleurs ! Beautifully framed with gorgeous colors and hues! This is gorgeous Steven! I really like the color too and hope your laptop gets fixed soon. Stunning explosion of light in this nicely composed scene. Gorgeous colors. Merry Christmas to you and yours, Steven! Bonjour Steven. Superbe photo d'un magnifique coucher de soleil. Joyeux Noël Steven. Amicalement Antoine. Quel beau cliché ! J'aime beaucoup ! Merci Steven, pour ton gentil message. Best Wishes to You and Yours for 2014 and sure hope it includes a return to these pages ! Happy New Year Steven ! All the best for you and your family! I'm just back from Africa and i wish you and your familly all the best for this new year 2014 ! Beautiful view with great colours!